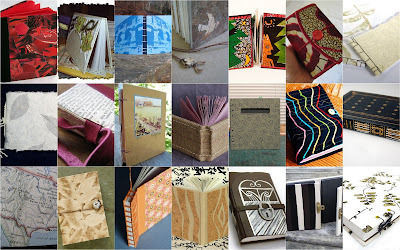 These 21 wonderful books are winging their way around the world as the Bookbinding Etsy Street Team completes our 11th book swap. Stop back by over the next two weeks as each book is highlighted here on the team blog. The next swap is in August. All BEST members are welcome to participate. Check the swap guidelines for more information about how it works. Beautiful books, and so nice to see so many participants! I can't wait to find out which book is coming to me, and hear about each book on the blog. Ooooo!!! Mine came today from Laura at Prairie Peasant and I LOVE it! It's awesome!